I am so proud to announce that 360 Arts will be working collaboratively with The Heritage Fund in particular our 13+ Actors have been selected for The Generations of Learning Project. Ashford Place is a charity providing social support in the Cricklewood area, including many elderly people. 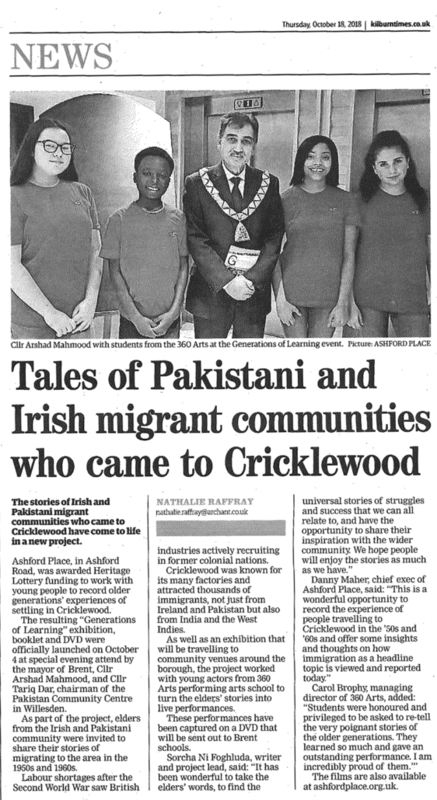 With funding from the Heritage Lottery, the Generations of Learning Project has been recording the oral histories of Elders from the Irish and Pakistani communities, to preserve, share, and celebrate migrant heritage. A key aim is to inspire younger generations from all walks of life, to encourage pride and confidence through the stories of the older generations. The Heritage Fund is working with an emerging director, developing her specialism in community theatre, who has also received training from Company 3. They have also been working with specialists on developing scripts based on the transcripts. The Heritage Fund are big believers in supporting local talent and local organisations, we are delighted to be working collaboratively with them on such an important project which is so meaningful and heartfelt, we hope to do justice to the Elders story of migration.